Signals Defense is an Authorized 3M dealer and carries all 3M window films. Security - deters smash and grab thieves, helps keep intruders outside the building. Facilities Protection and Enhancement - aesthetically plesing, conserves energy, protects interiors from fading and glare. Aesthetics - 3M anti-graffiti films help prevent vandals from permently arming your building's windows. Windows are typically the most inefficient and vulnerable part of a home or building envelope. They let in the sun's heat during the summer, let out manmade heat during the winter, cause annoying glare, and are typically the easiest way for an intruder to gain unwanted entry. 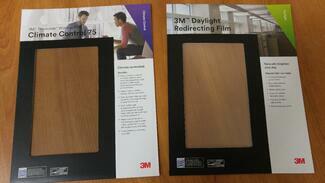 3M Window films have been addressing these inefficiencies for more than 50 years. Signals Defense is a 3M Prestige Window Film dealer located in the Baltimore metropolitan area. Our industry experience allows us to help choose the best film for your office or building. Rest assured that our installers are professional and courteous.